It’s Quahog week down in Cape Cod. So in honor of that we give you a Rhode Island tradition, the stuffie. But figured we would switch it up. Just like momma used to make, this is an baked stuffed quahog. Perfection to pair with some broiled scrod on a Summer night. 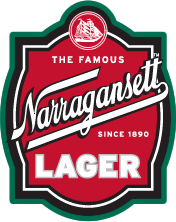 We recommend you wash it down with a cold Gansett. Shuck the quahogs, saving the juices and shells. To make them easier to shuck, you may put quahogs into the freezer for about an hour, or zap them in the microwave for 30 seconds to relax the muscle. Chop quahogs. Chop or tear bread into small pieces. Saute onions and celery in oil. 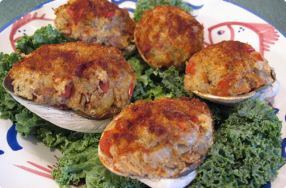 Combine quahogs, their juices, onions, celery, pepper, garlic powder and parsley. Add enough of the bread to create the desired consistency. It should be a little moist. If you add too much bread, moisten it with a little water. Stuff shells. Bake on baking sheet at 350 degrees for 20 minutes. Put a little paprika and additional chopped parsley on top after cooking. Makes 24.